In this article, Michelle Kelly discusses new research by EPG Health Media on the topic of European CME: HCP participation, views and preferences. Last month, thought-leaders and stakeholders of Continuing Medical Education (CME) convened at the 5th Annual European CME Forum in London (#5ecf). Here, focus seemed to be shifting away from the politics of CME (such as funding, accreditation and regulation), towards one common goal, the impact that CME has on patient outcomes. It was at this meeting that we released our latest healthcare industry report ‘The European CME landscape: HCP participation, views and preferences’. While the meeting focused largely on the growing need to ensure that CME is geared towards improved patient outcomes (a perhaps obvious yet often obscured goal at times), our research focused on the needs of doctors. There has been surprisingly little research into the changing CME requirements of HCPs in Europe, and while we (the healthcare industry) work towards systems that allow us to effectively measure patient outcomes, we are reliant largely on doctors to guide us on what (in their opinions) makes useful and effective CME. After all, doctors are more likely to participate in CME that meets their own requirements, so this is a prerequisite to improved patient care. The CME system in Europe is a complex, multi-level, multi-lingual and multi-regulatory system of learning, spearheaded by the EACCME. However, the common goal of ‘improved patient outcomes’ translates beyond borders, and in the effort to unify the various stakeholders in this system, there has been talk of standardising the regulatory framework for CME in Europe. Our study supports the need for a more standardised structure for accredited EU CME than currently exists. In particular, it is necessary to develop a structure that allows HCPs to easily establish validity of CME credits within their country of practice. More than 50% of survey respondents stated that it is important to them that their CME activities are sanctioned by the accrediting body for their country, however 49% of respondents said they had experienced difficulty ascertaining whether a CME activity was recognised within their country. Despite this, less than 10% of HCPs said they are deterred from participating in CME if it was not designed specifically for HCPs in their country. Online CME in Europe is still in its infancy (accepted in just 15 of the 27 member EU states) with very limited qualitative or quantitative research into the factors that influence physician participation1. Despite this, just 11% of study respondents said they do not participate in online CME (compared to 25% who don’t attend international conferences and 19% who don’t conduct printed CME). And participation in online CME is growing faster than any other, with 50% of respondents reported an increase in their participation in the past year, compared to 11% for international conferences and 17% for printed CME. ‘Cost’ and ‘time’ have strongly influenced these changes in CME participation. Half of survey respondents stated that ‘cost’ has a ‘very strong’ influence over their decisions to participate in individual CME activities and the main reason for survey respondents not participating in more CME is ‘lack of time’. These two factors have more influence over CME participation than factors such as whether it ‘addresses a gap in their own knowledge and skills’, will ‘assist in improving patient outcomes’ and ‘how interesting or engaging the activity is’, although these were still considered key influencing factors. Of the 89% of HCP respondents who participate in online CME, 64% actively seek it, 94% would like to participate in more of it and 30% claimed that ‘lack of availability’ prevents them from participating in more online CME. This presents a clear indication that the demand for online CME is significantly greater than current supply. Only 3% of HCPs believed that online CME has no benefits over other forms of CME activity. The topic of credibility versus industry funding of CME is complex. Efforts have been made in the US to address credibility issues through handing of budgetary control over to regulatory teams, but have in turn resulted in a reduction of pharma company financial support for CME2. In 2007, industry support accounted for 48% of the revenue of accredited CME providers in the US, and by 2010 industry support was down 31% from its peak 3 years earlier3. In Europe, these challenges are further impacted by barriers to implementation of CME activities across multiple regulatory &amp, accreditation bodies, languages, country criteria and cultures. However, there has been little investigation into the views of HCPs on industry funding and the perceived effect this has on access, quality and their decisions to participate in CME. EPG research shows that pharma funding has surprisingly little influence over respondents’ decisions to participate in specific CME activities. When we asked to what extent each of 17 possible factors influenced their decision to participate in CME activities, ‘the organisation funding the CME’ was cited as being of least influence. 56% of respondents rated ‘the organisation that funded the program’ as just a 1 or 2 out of a potential 5 on the scale of importance when deciding whether to participate in CME. Regarding online CME specifically, less than 10% of respondents cited industry funding as deterring them from participating more frequently. The majority of survey respondents believe that pharmaceutical funding of CME results in greater availability and that pharmaceutical companies should fund more CME. 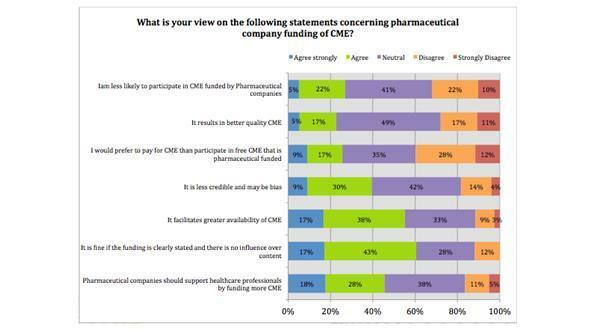 Despite these clear indications that HCPs in general see pharma funding of CME as positive rather than negative, the majority of respondents were neutral on the topic of whether it results in better quality CME and 39% of respondents believed that CME funded by pharmaceutical companies is less credible and may be bias. The study indicates however, that the majority of HCPs will participate in CME regardless of how it is funded. This means that any mistrust of pharma funded CME does not necessarily limit its ability to provide positive patient outcomes. What is the future potential and outlook for CME in Europe? I have reflected on just a few of the study findings here, but in summary, it highlights the importance of improving the quality and prevalence of affordable, accessible and convenient CME activities that cater to HCPs who lack time or budget and increasingly seek to work online. Credibility and trust, while not heavily impacting participation, are HCP concerns that need to be addressed, however this should not come at a cost to the doctors who participate, or the patients that they treat. But how long might these interrelated changes take to happen? 1. Costa, A., Van Hemelryck, F., Aparicio, A., Gatzemeier, W., Leer, J. W., Maillet, B., &amp, Hossfeld, D. K. (2010). Continuing medical education in Europe: Towards a harmonised system. European journal of cancer, 46(13), 2340-2343. 3. Steinman, M. A., Landefeld, C. S., &amp, Baron, R. B.—Are We at the Tipping Point? New England Journal of Medicine, 366(12), 1069-1071. Michelle Kelly is Division Head of Marketing and Market Research at EPG Health Media (Europe) Ltd. Established in 1998, EPG Health Media is a digital publishing and communication business that provides targeted access to over 350,000 healthcare professional worldwide via professional channel www.epgonline.org. Contact Michelle on 01892 526776, michelle.kelly@epghealthmedia.com or via Twitter @epghealthmedia. 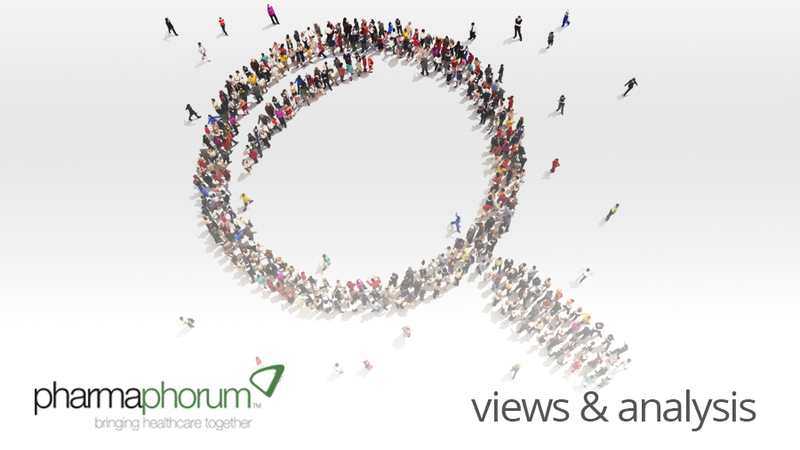 To understand more about ‘CME: The behaviour, demands and views of healthcare professionals (HCPs) in Europe’ download the free report here:- http://www.epghealthmedia.com/industry-reports/cme. Who should be responsible for demonstrating whether industry funded CME activities in Europe lead to improved patient outcomes?